Growing up, my bedroom looked like a nursery. A doll bassinet, a doll crib, and various accessories were an integral part of the decor. Whenever someone asked what I wanted for Christmas or my birthday, I'd say--you guessed it--"a doll." No matter how much fun I had, nothing quite measured up to when my aunt would bring my little cousins for a visit. As infants, most of them got rides in my large doll carriage. Watching the babies and interacting with them translated into making my playtime more like the real thing. My aunt passed along their clothes for my dolls. I didn't want the silly clothes they made for toys. They didn't match up to baby clothes. I held realism in high regard. While our characters aren't real people, we strive to capture the experiences of daily life on the page. We're challenged to create story worlds and people, who are believable to our readers. Life experiences, reading, music, and movies all give us a frame of reference for our writing. People watching, snippets of conversation, facial expressions, and tone of voice all get stored onto the brain's hard drive for future reference. How do you invent your characters? How do you keep your characters from sounding alike or a clone of yourself? That's a hard one. I think I've succeeded with one of my recent characters but he is still a clone of several men I've known in my life. I always seem to have to piece them together with characters I know. Thank you for your thoughts about this! I abhor writing in which the characters speak and behave in ways that are (while somewhat realistic) simply a copy of the cheesy character in the last book I read. It's as if instead of writing from real life, the author wrote from some sort of stiff, doll-house setting. I love a book in which the author can break away from that and let us see a character as a real person, not a card-board cutout! My biggest challenge is keeping all the characters from sounding and reacting like me. In the latest book, I've deliberately given my MC a personality polar opposite to mine. Jeannie Campbell, over at Character Therapist, helped me with some traits for the MC's profession. Also, looking up personality types gave me some tips. Thanks so much for giving us the reader's perspective. Believability is a key ingredient to creating lifelike characters. Whatever anyone thinks about, "The Shack," it met this criteria. Readers had difficulty distinguishing whether it fiction or non-fiction. As for developing them, I do very little pre-planning. I have their name, age, occupation, and maybe what they look like, then I put them in a situation and see what they do. It's kind of like getting to know a new friend. It's fun to discover new things and get surprised. Characters are so important! Actually, I usually build my characters before I construct the story. One main thing I pay attention to is speak patterns. We don't all talk a like. I also try to establish clear "likes" and "dislikes" for my main characters. Even if I don't end up using all the details I've come up with for my characters, I think it is important to flesh them out as much as possible. GREAT questions, Susan! Love the doll image. Hmmmm. I pick that scene that sticks in my mind and forces me to write the story, then "build" the character around that action. Being given away by your mom...how would that "mold" character? Bit by bit, a character is created. LOL! How about a few characteristics here and there? Wow! I guess acting experience would help a writer develop characters. My methods are similar to yours. As a pantser-wannabe-plotter, I find it a strain on the brain to do character sketches. My pantsing ways carry the danger of everyone sounding like me, so I try hard to do some pre-planning. Great tips! I've been thinking a lot about local expressions. After living in one place for many years, it surprised me to discover the variations in terminology. Closing on a house vs.
All of that. It's all in observation for me, and, like you said, storing it away to draw on later. I can imagine that room of your youth! Very serene and very warm. So, you take the storyline first and built a character to fit? As I think it over, I can see how I've done that on occasion. It's certainly true of my latest manuscript. Life events build character in real life. Why not in fiction? I also think my time in theater helps with this challenge. Like many writers, I try to "see" my scenes as they happen. Once I have my characters really living and breathing, then I record what they say. I don't worry so much about word choice. In historicals, the biggest challenge is to get them to sound like nineteenth-century people rather than contemporary Americans. None of them sound like me, for that reason! This is tricky, Susan. I tend to think of an interesting name or an interesting profession or an interesting story I read about someone and then from there my imaginary person "comes to life." I need to think about this one, Susan. I write from my experiences, so not to clone a character is difficult. Sometimes I'll read psychology articles to understand different personalities to make my character more real. But then I'm not being very creative! It's a fine balance, for sure. I love the doll image too. Now, there's an interesting point. I never thought about the difficulty of sounding like an person from the 18th century versus now. As I read all the comments, I marvel at the variety of methods writers use. 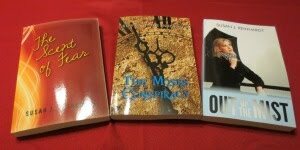 With my latest manuscript, I started with the story and created the character to fit. I guess that makes this book plot driven rather than character driven. I have a doll that looks similar to the picture. Love that face! The MC in my first book had a lot of me in her. I think it's part of an author's right of passage. We go through stages. Oh dear. My characters ARE myself and my husband. I admit to embellishing a voice tone or a nasty look now and then. But I have to be careful or I'll soon be writing fiction! I love that you mentioned facial expressions. That is a great thing to add. Mostly, I feel that I know my characters. I could tell you about them. I hope that comes across on the page. I always think about the faces babies and children make and try to describe them. It's a great exercise. Wow. Those are some tough questions, Susan. My characters usually come from real-life ideas or dreams. The challenge for me is making different characters sound and feel different on the page. That takes a lot of playful experimenting and revision, revision, revision. The stories I have tried to write have been different. I am English, Scots-Irish, and Welsh. My MC in one story was of Italian descent. Not only did I have to have her own look and sound, she was in a shady profession. The current female MC is a nurse who grew up on a farm. No, I am not a nurse and,no, I didn't grow up on a farm. It's tough writing multiple characters. Each must have their own history, worldview, different upbringing, plus all the other factors that make us unique. My book includes a family. Each parent comes from a different background, and the son is a blend of the two. There are times when I wish I was more of a plotter. However, these characters become so familiar after living with them that I know how they will react to situations. Thanks for joining the discussion. Giving a character a different background and nationality from yourself is a great way to avoid the clone problem. 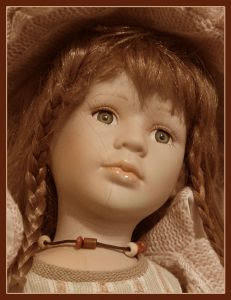 I enjoyed reading about your childhood experiences with dolls. I was a stuffed animal gal myself. They were very real to me. I remember one Thanksgiving when I hauled them all in front of the TV to watch the Macy's parade. I didn't take just a few of them, otherwise the others would feel bad. I base my characters on real people. I love people watching in airports and other public places. Often, I carry a notebook with me and jot down actual lines of dialogue. Oh, I love the stuffed animal story! Real people are always good sources - as long as they can't recognize themselves!